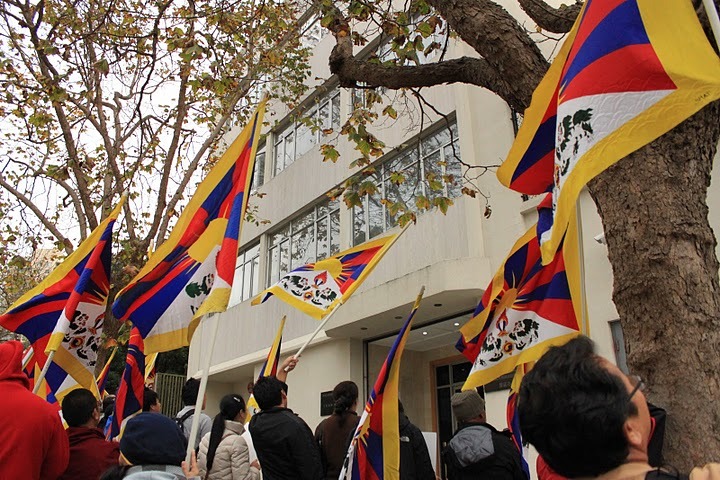 Dozens of pro-Tibet activists gathered outside San Francisco’s Chinese consulate on Oct. 29 to demonstrate against the Chinese Community Party’s proposition to make Chinese-Mandarin the official language in local schools. A series of protests began Oct. 20 in Western China involving thousands of students following the announcement and activists are saying that this policy threatens the identity of Tibetans and other minorities established in China. “These policies targeting a set of minorities resemble the tactics used back in the 80s during the Cultural Revolution,” said SF State student Lhamo Dolma, 21, International Relations major. “Even though China is massively progressing in the world economy, policies like this proves the weakness of a government not able to protect the rights of its citizens,” Dolma said. Protesters used bull horns to amplify their slogans while shouting “Equality of race and freedom of language.” The Tibetan advocates accuse the CCP of detaining 20 students already since last Saturday’s protests in China. Xinhua News, the official press agency of the People’s Republic of China released statements from officials denying allegations of targeting the Tibetan identity through the oppression of their language. China was scrutinized many times for their ways of operating internet censorship and government controlled media. Google experienced this first hand when it announced it’s decision to pull out of China back in March after the company discovered China-based cyber-attacks trying to breach Google’s infrastructure. The company moved to Hong Kong and China’s internet system is currently censored by government authorities. Education Department Director Wang Yubo of the Qinghai province in China said “the program to teach classes only in Mandarin Chinese was not aimed at wiping out Tibet’s native tongue,” according to Xinhua. Officials were reported saying that they will respect students and parents viewpoints before enforcing the policy but no promises have been made yet. However, according to the document submitted to Qinghai government in China, over 300 teachers have signed their names to a letter requesting the Chinese government to reconsider their proposal, stating that it does not benefit the education system. 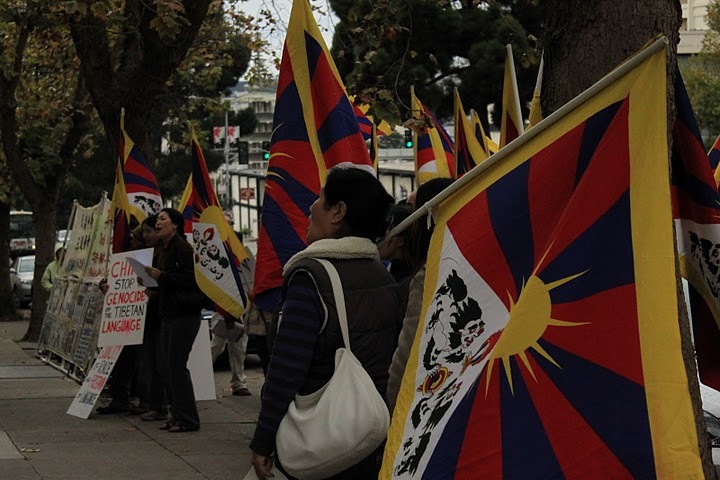 “Freedom to speak one’s own language is inherent to the principles of freedom and equality and are being forcefully denied to Tibetan students as a direct result of China’s illegal occupation of Tibet,” said Giovanni Vassallo, SF State alumnus and president of Bay Area Friends of Tibet. The tension between ethnic minorities and the dominant Han Chinese has become an issue in the world arena since the March 2008 protests in Tibet that left over 200 people dead, and resulted in a ban against foreign correspondents and journalists to China. Ethnic groups in China were seen on cell phone videos uploaded on youtube demanding for the halt on Han Chinese migration to their rural towns through the new railway system which they said was hurting their local economy. San Francisco witnessed this first hand during the controversial Beijing Olympic torch‘s arrival back in April of 2008. Thousands of activists opposed the torch relay ceremony that was held in San Francisco – the only city to receive it in North America. Advocates condemned China’s conduct in relation to human rights, including torch bearer Majora Carter, executive director of Sustainable South Bronx. “So, although I have no longstanding connection to Tibet, I would not be able to call myself a drum major for justice if I did not speak my concern for Tibetans inside Tibet who are being persecuted by the Chinese government for expressing their desire for freedom,” Carter said in her statement to the press that day. Though opposition groups accuse this policy of being a human rights issue in China, the Chinese government officials claim their intent is to bridge the education gap between China’s various ethnic groups and promote development in ethnic minority areas according to Xinhua. Mandarin is the common language spoken by more than 90% of the Han Chinese population however, majority of immigrants tend to speak languages of their own dialect as a mean of preserving one’s culture. 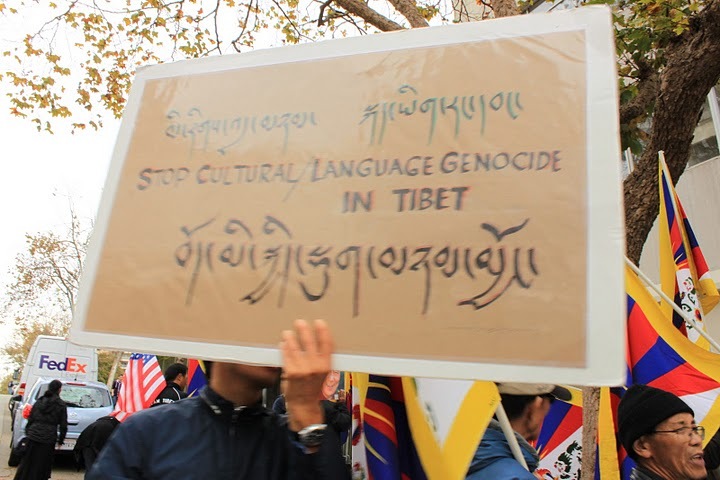 “We call upon the Chinese government to adhere to its own constitution and respect these principles at the heart of the ethnic Tibetan identity, they must allow the Tibetan language to be respectfully taught in all of Tibet,” said Vasallo. any videos, pics of the protest ?? aYO, “No response from SF State Chinese associations” doesn’t surprise me and it’s interesting they enjoy the Freedom & prosperity in the U.S, while their country-men(Chinese) are also under brutal communist rule in China. Self-fish & narrow-minded! But YO, what goes around, comes around, the law of Karma. Independent minded Tibetans & not the hive mentality must take the fight for ourselves, Justice,Independence & Freedom. Even Kashag in exile seems to be selling-out to the communist demands. http://tibettruth.com/ What a shame! I ain’t going out like that! What you do & How you live in this realm, you’ll deal in the next. aYo, Rangzen! Thanks for writing this piece, we share a lot of common perspective on life.. I wish you could write more.. I would love to check out your previous pieces of work soon.. This issue about Tibet has particularly hit home (India) because of so many Tibetan refugees who live under privileged lives in a few parts of the world, suffering silently and waiting for China to retract their presence on their own piece of land.. I think modernization has taught the world a lot but a few who make world and country leaders choose to remain archaic in their ideologies.. The likes of the great Dalai Lama are still trying.. And it is refreshing to think of him today! Great and very informative post!! I am not too informed of the current school systems in Tibet, are classes taught in Chinese or Tibetan? I feel its a catch 22. If mandarin is enforced in these schools, the Tibetan students might have a better chance of success in China, but at the cost of their own language. While if the schools officially teach tibetan, then the students well retain their tibetan language, but will be at a disadvantage against Chinese literate students. What is the general feeling about this issue outside of china?